Slightly eccentric, entirely focused on character drama, this anime film feels a little out of place as an anime film. Satoshi Kon seems to be more comfortable dealing with realistic subjects in a realistic setting. With this, it really shows that he should really start thinking about directing live-action dramas because he seems quite adept at that. But he has gone on record to say that he loves drawing too much to give it this medium. Unlike Ghibli's anime-ish stylings, Kon sticks to a more realistic style that is still somewhat recognisable and unique. For me, the most recognisable features of his films are its slight weirdness or eccentricity, and the animation. 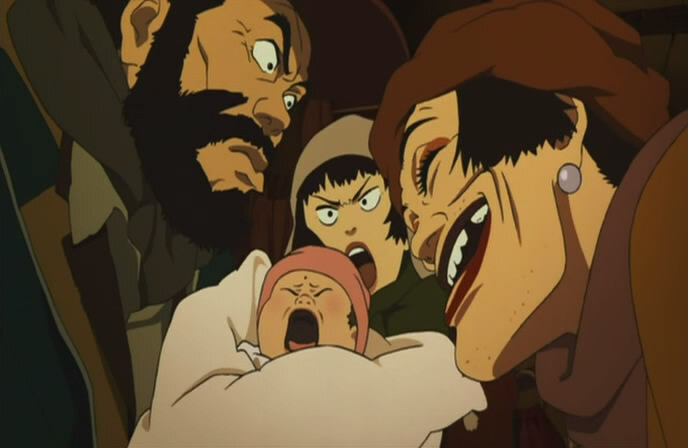 Tokyo Godfathers is a well-animated, heart-warming tale, but drags on slightly too long and lacks the creativity that made Perfect Blue and Millennium Actress such a joy to watch.